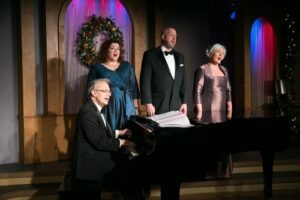 Christmas fills the air, the mind, the theatres, the restaurants, the stores, and likewise, Quality Hill Playhouse as their annual “Christmas in Song” brings a mix of popular and spiritual music in cabaret style to its audiences. 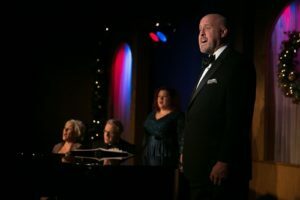 Annually, J. Kent Barnhart, artistic director of QHP selects a theme for the year, the music for the show, and then hires the best cast to perform the evenings musical feast. 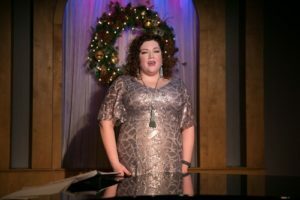 This year, Lauren Bradshaw, Brad Dawdy, and Lindsey McKee lend their voices to Barnhart who does triple duty as singer, accompanist, and director, resulting in a beautiful, melodic expression of Christmas. 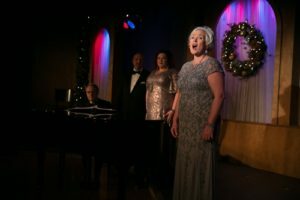 “Quality Hill Playhouse continues its annual tradition of presenting holiday music in a cabaret setting when “Christmas in Song+ opened Nov. 23 (running through Dec. 23). 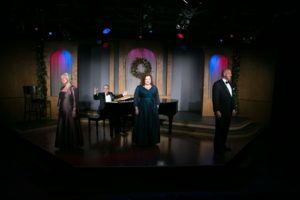 The production features the theatre’s signature blend of sacred and secular Christmas songs, including beloved carols (“Silent Night,” “Go Tell It On The Mountain,” “Joy to the World!”), classical favorites (“O Holy Night,” “Ave Maria”), popular tunes (“White Christmas,” Mel Torme’s “The Christmas Song,” Barry Manilow’s “Because It’s Christmas”), songs from treasured holiday television specials (“Christmas Time Is Here” from A Charlie Brown Christmas, “The Peace Carol” and “When The River Meets The Sea” from John Denver and The Muppets: A Christmas Together), and even a few hilarious surprises. 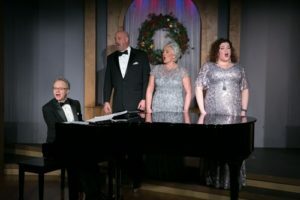 Vocalists Lauren Bradshaw, Brad Dawdy, and Lindsey McKee, led by pianist/emcee J. Kent Barnhart, will lighten the hearts and souls of audiences with the wonder and joy of the season through some of its most beautiful music,” according to Quality Hill. 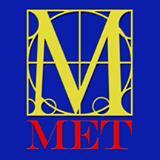 American Prize in Voice award (professional division). “Christmas in Song” incorporates known and obscure songs of the season. The selections are strong and the performances outstanding, but the winter weather and snow just sucked all the energy from the auditorium. The audience did not respond well. They gave no energy to the performers. 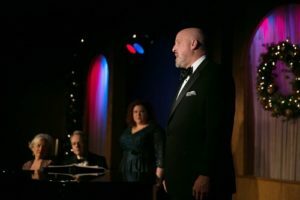 And, as the reviewer I watched as the quartet of performers kept reaching to the audience, making contact with the audience, and appealing to the audience and received flat applause and no return energy. I must say, this was probably the strangest evening I have seen at Quality Hill. The selections were solid choices, but the unenthusiastic audience response dampened the spirits. Intermission brought no chatter or anticipation for Act II. Nor, did intermission create any comments on Act I. “Christmas in Song” generally presents a thought-provoking medley of music where the words mean far more than the notes. For this, Barnhart needs only his talent on the 88s to allow his performers to do their vocal gymnastics on lyrics. This particular night, I don’t think infusing well-known seasonal songs would have changed the audience reaction. 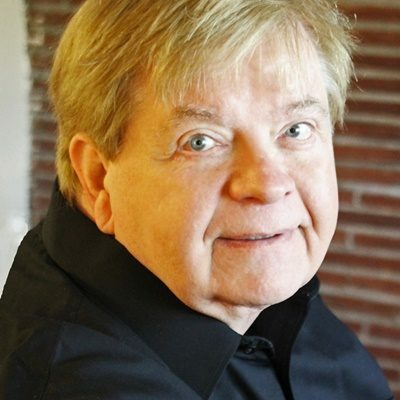 Creating a new production annually of Christmas music to appeal to a wide audience means Barnhart has most likely covered all the carols in a church hymnal, the all-time children’s favorites, and a host of seasonal fare like “Winter Wonderland,” “Sleigh Ride,” “Silver Bells,” “Rockin’ Around the Christmas Tree,” and all the rest. I don’t think adding those would have ignited the audience, but it’s a thought for subsequent productions. Particularly outstanding in 2018 “Christmas in Song” came at the end of Act I. A combination of “I Believe” and “Ave Maria” were performed by Dowdy and Bradshaw. Their performance on this was stellar. Following that, McKee sang “O Holy Night” with her vibrant soprano tone that could fill a cathedral. The last two songs should have caused explosive applause. They were that fabulous. Act II brought more contemporary music, including the final pieces, “White Christmas” and “Go Tell It on the Mountain.” But, it was a strange night for QHP. The audience just seemed reserved and maybe too tired from the Thanksgiving holiday and the unplanned weekend snow storm. QHP always delivers a strong show. This one continues that tradition. With a different audience, no snow on the ground, and more Christmas excitement building, future shows will generate the appropriate energy between performers and audience. 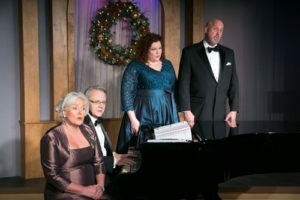 “Christmas in Song” runs through December 23 at Quality Hill Playhouse, 303 W. 10th Street, Kansas City, Mo. Single tickets are $41, with discounts for students, seniors, and groups. Pro-rate season tickets are $175 each for the five productions remaining through July 2019. 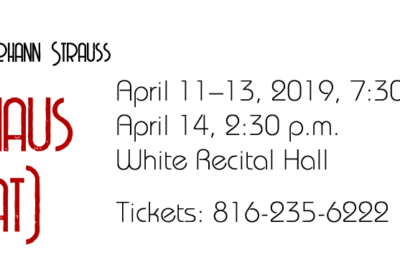 For tickets, call 816-421-1700. Tickets and more information about the venue and upcoming shows can be found on the Quality Hill Playhouse website. J. Kent Barnhart founded the producing company Quality Hill Productions in 1995 and secured the lease on Quality Hill Playhouse in the same year. The company regularly produces six cabaret revues and off-Broadway musicals each year, with a season running from September through July. The theatre has seven rows and seats 153, providing one of the most intimate theatre experiences in Kansas City.